You can’t build your business on sand! 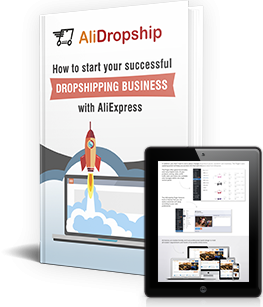 In dropshipping, the success of the whole venture highly depends on the reliability of your business partners. 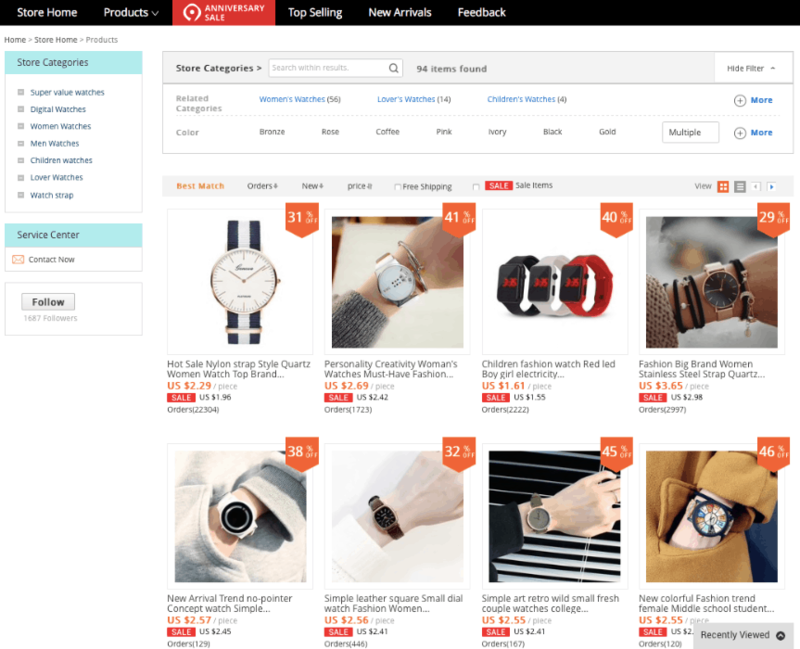 But, how to find a supplier for your online store that won’t let you down? Let’s figure it out! What would you want from your perfect supplier? Some people prefer their business partners to set low prices on their products. The others believe that the most important thing is the supplier’s aspiration to keep their end of the bargain. Actually, both of them are wrong and right at the same time. Ideally, you need to strike a balance. Low prices are necessary to make your online store competitive and profitable. At the same time, your business partners’ credibility should put your concerns of getting in bad with customers to rest. Another thing worth mentioning is that the less suppliers you have, the better. Imagine a buyer ordering several various items from your online store. If all of them come from different distributors, what are the odds that your client gets all the goods at the same time? Of course, this delivery disruption might irritate customers. Thus, you need to focus on a limited amount of business partners for your online store to keep your clients pleased. Moreover, sending many orders to one suppler will definitely reward you with a discount. Considering all of these points, choosing a business partner poses a serious challenge. Your suppliers can either ruin your online business or make it flourish. Fortunately, it is possible to fix these issues if you are dropshipping with AliExpress. There, you can easily find plenty of sellers. The range of items each of them has can perfectly suffice your need – not to mention their knockdown prices! All you need to do is to compare the suppliers’ prices and evaluate their credibility. Weighing up AliExpress offers doesn’t cause any troubles with AliDropship Google Chrome Extension. It’s fast and convenient. However, your need a closer look at the process to make the right choice. What is the first thing you need to pay attention to when searching for a suitable supplier for your online store? Of course, it’s their prices. Although low prices play a big role, they may distract you from the other important sides of the issue. Meanwhile, you can’t go without them to pick a reliable business partner. Well, here are the things you should keep your mind on. Today, it’s really hard for businesses to conceal their flaws. The Internet made companies strive to provide only the best service. Bad-quality performance is brought to light in the blink of an eye. And this could be fateful for a company. If you own a small business, it’s not a big problem to identify the problem and sort it out. But, what if your company is, let’s say, Uber? Then, if your driver messes something up, the whole organization takes flak for this. However, companies like Uber, Amazon and AliExpress have a solution to take the heat off them and weed out the weak links in the chain. They allow customers to rate their drivers, sellers, etc. This way, consumers can better understand whether these persons are trustworthy or not. So, the first thing you should pay attention to while choosing your suppliers is their rating on AliExpress. Go to AliExpress and open the product page you like. There, at the top of the screen, you will see a tab with the name of the supplier’s store. Click on it to move on to the main page of the distributor. Now, you see the whole range of the items this supplier offers. Apart from that, you can see whether this AliExpress store is well-customized, filled with appealing pictures, etc. But what we need now is its rating. It is 96,2% as it’s shown in the image below. The rating is quite high. This means that the customers appreciate the quality of the products and services and give the seller good grades. It’s the first sign that this supplier is worth working with. Rating is the most important thing you need to look at. As a rule of thumb, if a seller’s rating is lower than 95% – you’d better find another one. Well, if suppliers find favor with customers, it’s surely great. But, does it mean they are reliable? Could you be sure they won’t upset you? Only time will tell. Time they’ve been in business. The longer suppliers have been operating on the platform, the more confidence they instill. On AliExpress, you can easily find the data. Look at the picture below. 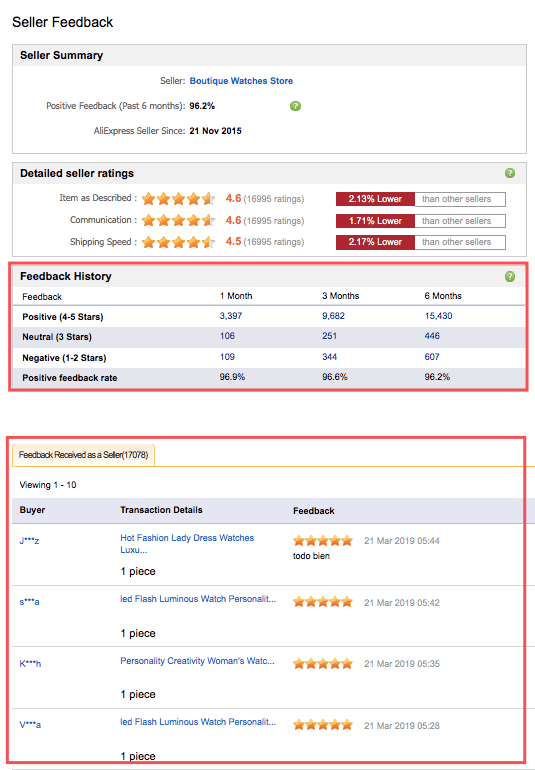 As you can see, this seller has spent 3 years on AliExpress, and achieved the rating of 96,2%. The combination of good quality and longevity should do the trick, shouldn’t it? 3. Did you find a supplier with a “Top Brand” sign? One more thing that can strengthen your confidence in your suppliers is the “Top brand” sign. You’ve already made sure the sellers’ stability is tested by time and their products’s quality is satisfactory. To help you make up your mind, AliExpress marks the most reliable and successful distributors with a special sign. It shows that you can safely trust this supplier. If someone says that 90% of their clients give them a lot of praise, it sounds great, right? Yeah, it does. But what if they have only 10 clients? It’s not so striking now, is it? To get the whole picture, it’s important to consider the number of followers a supplier has. A case in point is the image below. It’s not difficult to notice that this supplier has quite enough followers to take the rating seriously. Sometimes, it might be tempting to jump at the opportunity to work with a high-rated supplier. But, a high rating, longevity and huge number of followers could hide some important details. Some sellers tend to show some decline in their performance over time. For example, they had been providing great service for 3 years. But, 4 month ago something happened. The quality of their goods and service have been going down since then. Of course, customers have been giving lower grades to the sellers in these 4 months. However, this doesn’t reflect much on the overall rating due to the plenty of previous good grades. That’s why you need a closer look at the rating dynamics. To do this, just click on “Feedback” tab as shown on the picture below. You will find yourself on the seller’s feedback page. There, you can see the supplier’s rating in the past 6 months. It matches the overall score, so this supplier keeps up the service at decent level. Since you’re on the seller’s feedback page now, you can find more valuable details there. Along with the distributors’ ratings for the last 6 month, it’s important to know how often people buy from them. 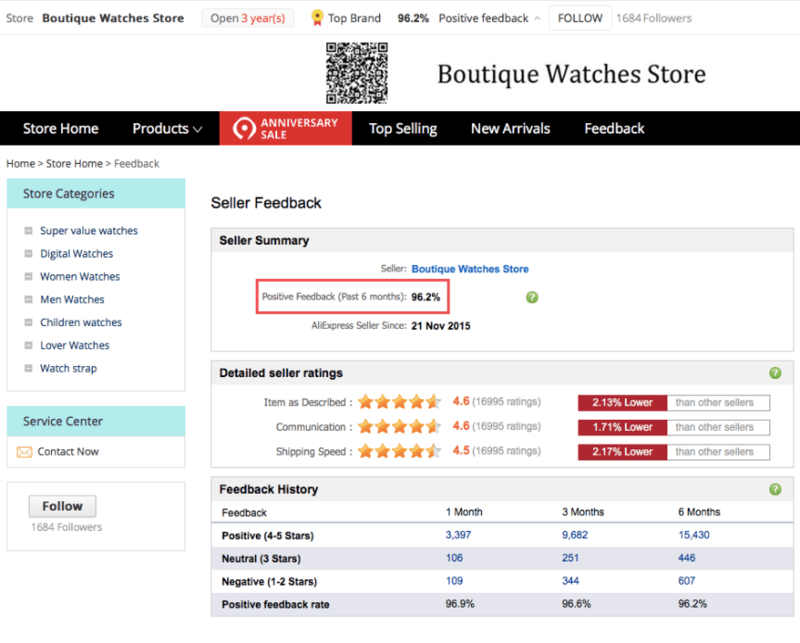 You can explore the supplier’s feedback in detail to understand how many orders the seller has had in the last 1, 3 or 6 months. Apart from that, you can look into customer reviews to learn more about the products quality. Marketing is a crucial part of dropshipping. 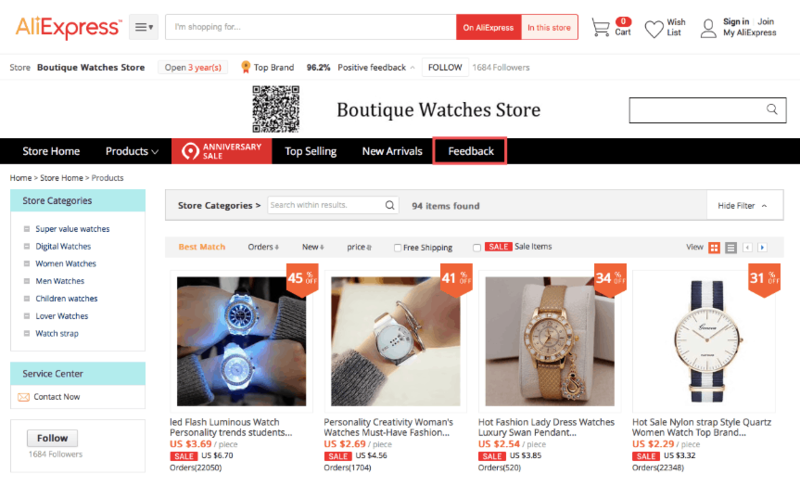 While searching AliExpress for reliable suppliers, you should think of your future promotional campaigns. You need to design your online store perfectly and create appealing promotional posts. For this purpose, good visual content is vital. Good news is that you can find great product pictures made in the same style right on AliExpress stores’ pages. Look at the image below. Your product pages content should be engaging and informative. Without enough good-quality photos of the products, it’s impossible to achieve. So, you need to make sure that AliExpress sellers’ product pages contain multiple quality photos of the product taken from different angles. It is also great if the seller provides product videos. It’s better to see something once than hear about it thousands times. What is really crucial for online shopping is visibility. You can write brilliant detailed descriptions of your products. But, it may not conjure up a clear picture. Customers want to be sure an item is the exact thing they need. They want to see it with their own eyes. 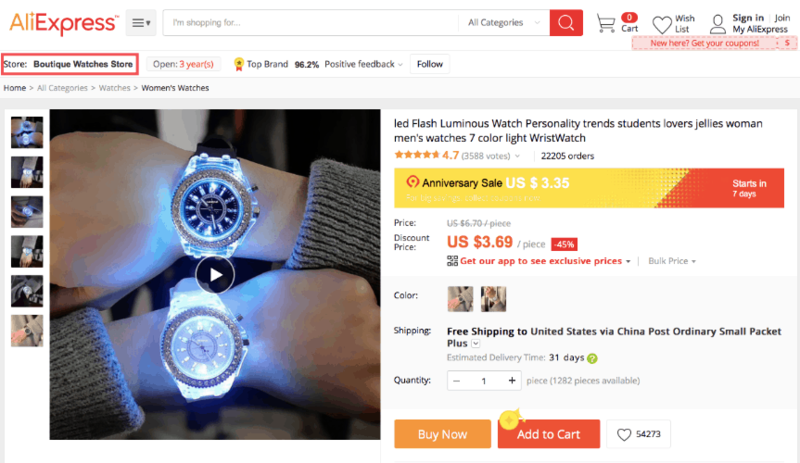 Many AliExpress sellers have such videos on their product pages, like the one you can see on the picture below. One of the most essential part of being successful in dropshipping business is having a good reputation. The better part of this depends on your business partners. The wrong choice could cause big troubles for you. However, if you know how to find a reliable supplier for your online store, you can run your business process smoothly. And your pleased clients are going to come back over and over again. 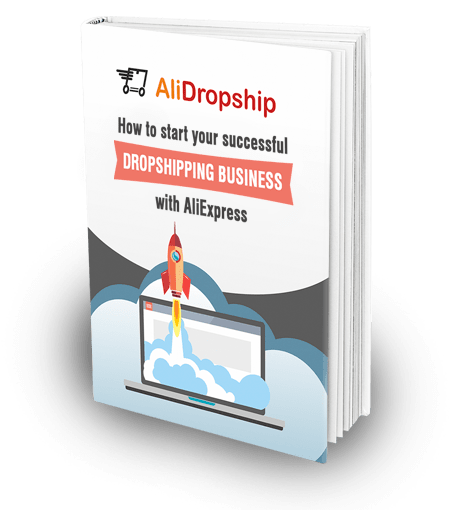 Well, now you know how to find a supplier for your dropshipping store! Simply follow these guidelines and enjoy your business growth. If you have any questions left, please write them in the comment section below: we’ll be happy to clear it up. first of all thanks andrey for ur valuable information.but one matter hovering on my mind,is there any policy or system of refunding after getting trouble on her product specially electronics goods from supplier? Hi! Thank you for your comment. There is no special policy. You should talk over the terms of refund with your supplier. If you choose your suppliers by following the tips we’ve listed, it won’t pose a big problem. They will eagarly make it up to you!